In the previous post, I showed how you can get full listings of your execution plan costs. Knowing what the values you’re dealing with for the estimated costs on your execution plans can help you determine what the Cost Threshold on your system should be. However, we don’t want to just take the average and use that. You need to understand the data you’re looking at. Let’s explore this just a little using R.
The mean function is going to get me my average value, which, in this case, is 0.8755985. If I just accept the average as a starting point for determining my Cost Threshold for Parallelism, I guess I can just leave it at the default value of 5 and feel quite comfortable. This is further supported by the median value of .0544886 from my data. However, let’s check out the costrange value. Knowing an average, a mean, or even a median (literally, the middle number of the set), doesn’t give you an indication of just how distributed the data is. My costrange, the max minus the min, comes out to 165.567. In other words, there is a pretty wide variation on costs and suddenly, I’m less convinced that I know what my Cost Threshold should be. The next value that matters is the Standard Deviation. This gives you an idea of how distributed your data is. I’m not going to get into explaining the math behind it. My standard deviation value is 8.301819. With this, I know that a pretty healthy chunk of all my values are less than a cost estimated value of 8, since a single standard deviation would be 8.301819 on top of my average value of .8755985. With this knowledge, I can start to make informed choices. I’m not relying simply on an average. I can begin to think through the process using statistics. Just to help out with the thought process, let’s plot the values too. Clearly, this doesn’t give me enough to work on. 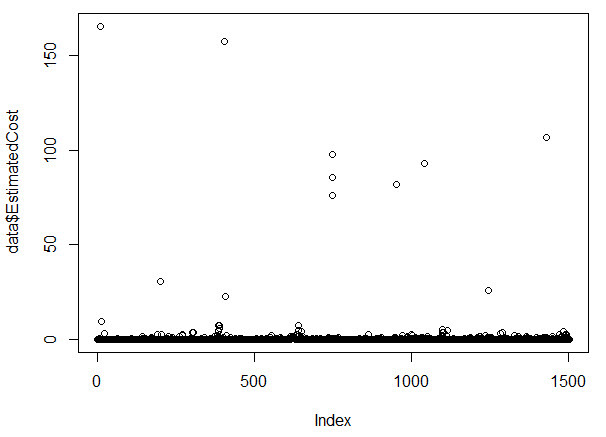 Most of my data, nearly 1500 distinct values, is at one end of the distribution, and all the rest is elsewhere. I can’t use this to judge any kind of decision around my Cost Threshold. Now I can begin to visually see what the standard deviation value was telling me. The vast majority of my costs are well below two standard deviations, or approximately 16. However, let’s clean up the data just a little bit and make this as clear as we can. That one pretty much tells the tale. The vast majority of the values are clumped up at one end, along with a scattering of cost estimates above the value of 5, but not by huge margins. However, using the math that I can quickly take advantage of, and the ability to plot out the data, I can, with a much higher degree of confidence, make choices on how I want my Cost Threshold for Parallelism to be set on my servers. From there, I measure the affects of my choices and adjust as necessary. Nice. Wonder if this can be done in powershell? I’m a little reluctant to add yet another programming language. Might be like those instrument flight rule ( IFR ) pilots who only put in the minimum time per year flying on instruments — most likely unsafe when they really need to use the skill. Yeah, it might be. I’m trying to explore and understand R, so I went there for my math & graphs. However, it’s not the only way to skin this cat, I’m sure. Thanks! I’ll try to avoid grossing people out too much (too often). OK, fine. But I don’t know why I should raise my Cost Threshold at all. Nearly all of my statements have higher costs when I run them with the query hint “Option(maxdop 1)”. Beside that they are slower with that hint as well. I assume that setting this hint has the same effect on my query as setting the Cost Thresold up. Yeah, they probably will have higher costs because setting that hint will completely change the plan that gets generated. You can’t compare the two plans costs at that point. The primary difference is, some plans will benefit from parallelism. By setting the MaxDOP to 1 (hints or through server settings, and I’d suggest server settings if you’re really going to do that, easier to undo later), you’re not adjusting the cost threshold to allow some queries to run parallel and others not to based on their estimated costs, you’re just forcing serial plans on everything. The reason you would raise your Cost Threshold is precisely where you find yourself, the plans are performing poorly with parallel execution. Raise the Cost Threshold so that those plans get serial plans naturally instead of through hints. Higher cost plans, the ones most likely to benefit, can then still get a parallel plan without you having to muddy your code with hints. You adjust one setting, in one place, that can be easily change later, rather than having to go to X number of queries and add a hint. It’s a much more efficient mechanism for controlling your servers. Not a problem. And it gave me an idea for another blog post. Appreciate the questions. Thank you. Hello Grant, very good article. Is normal very high values in estimated cost? The instance is a SQL SERVER 2008 R2 SP3. Right, so in your case the distribution isn’t in any way normal. You’d be best served by tossing that value out and see how the rest behave. From there you can make a determination on a good choice for cost threshold. Regardless, you sure would want that query to go parallel. And no, that’s an extremely high estimated cost. It sounds like you’re moving lots of data with either no filtering at all or your filters aren’t using the indexes you have (if you have them). Nothing but guesses as to the cause. Hello Grant, thanks for your answer. Is it possible that a plan with Parallel=0 when executed, the plan used more than one CPU? It is the result to collect plans executed in 12 hours of work along 5 months. This information is collected out of hours’s work. and it sent to my computer. No. If a plan didn’t go parallel, it’s just using a single thread. Parallel plans use multiple threads. You are correct, the cost threshold for parallelism ensures that only plans with an estimated cost greater than that value will go parallel. Hello Grant, a last question, please. 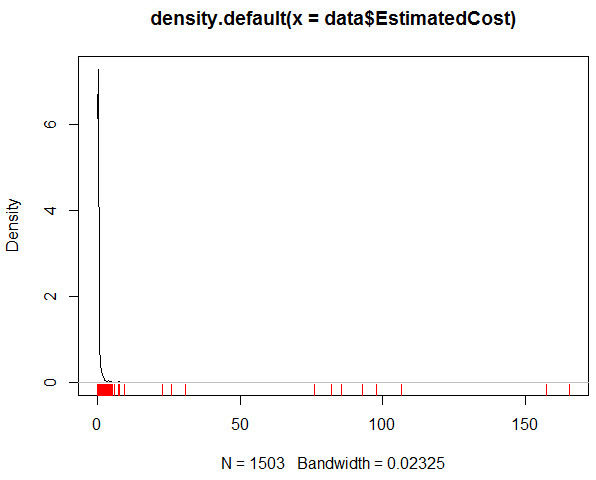 Is normal that more of 9000 query plans with estimated cost > “cost threshold for parallelism” have parallel = 0 ? It’s hard to define what “normal” looks like. Normal for your system is abnormal for mine. However, the question is can something exceed the cost threshold and still not go parallel. The answer is yes. 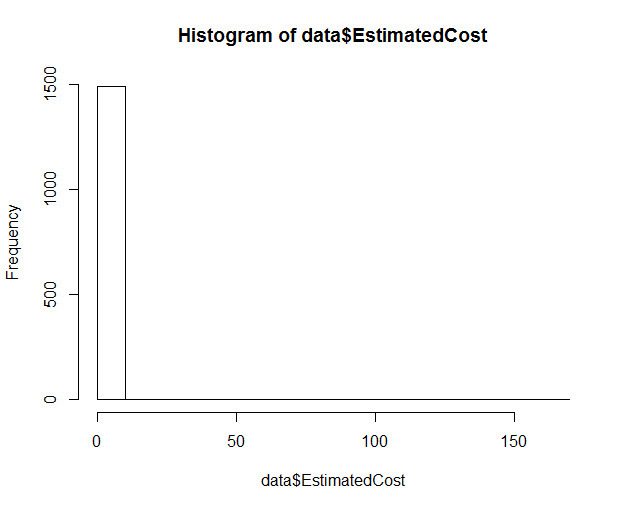 When a query exceeds the cost threshold it doesn’t automatically go parallel. Instead, the optimizer considers parallel plans. Will a parallel plan result in a lower cost than the serial plan? If so, yeah, you’ll get parallel execution. If not, you won’t see parallel execution even though the cost threshold was exceeded. Now, I’m not looking at your system, so I can’t say what “normal” looks like there. Based on the information I have, your plans are exceeding the threshold but going parallel won’t make them run faster in the optimizer’s opinion, so you still have a single threaded execution plan. NOTE: If you have a lot of ad hoc queries, you could be seeing stuff that’s all over the map for queries that are essentially very similar or even largely the same (there have to some differences or you wouldn’t have more than one plan). This is where you also have to concern yourself with how many times each of those queries is being executed so that you have some understanding of what is causing load on your system.